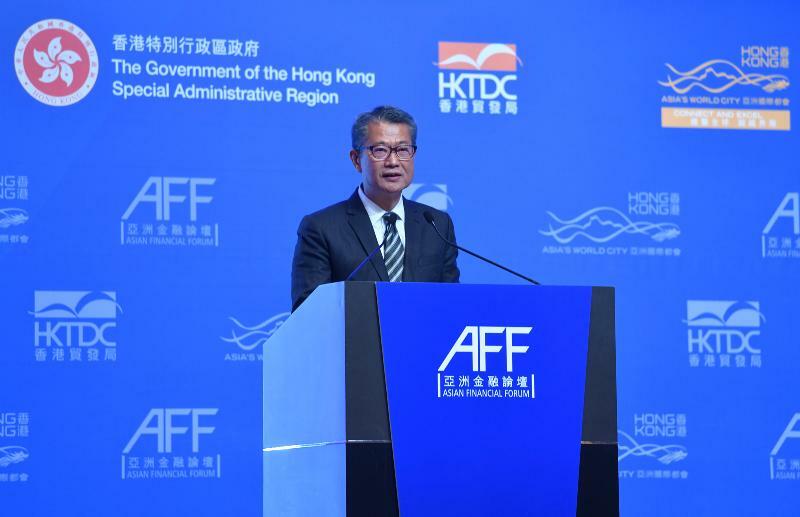 Following is the speech by the Financial Secretary, Mr Paul Chan, at the Asian Financial Forum 2019 keynote luncheon at the Hong Kong Convention and Exhibition Centre this afternoon (January 14). It's a pleasure to be here for today's luncheon, on the opening day of the Asian Financial Forum. We are in the opening weeks of 2019. While saying "Happy New Year" to all of you, I think it's fair to say that many of us welcomed the new year in an anxious, unsettled state. Indeed, that prevailing mood has seized the attention of much of the world for some months now. Given the uncertainties regarding the rules-based multilateral trading system and globalisation in general, this high-level Forum, which has attracted more than 3 000 leaders like you from all over the world, offers hope through considered discussion and lively debate. Hong Kong is the natural setting for such discussion and debate. After all, Hong Kong is where East and West have long gathered to connect - to trade, to do business, to seek investment and, ultimately, to excel. Our keynote luncheon speaker, the Honourable Robert Zoellick, knows a thing or two about excelling and surely about global adversity as well, having served as the World Bank Group President through the global financial crisis. Like you, I am looking forward to his address, to his thoughts and observations about these testing times. For the next few minutes before handing over the stage to Robert, allow me to focus on what I know best, i.e. Hong Kong, about what we have done and what we are doing to prepare ourselves for the future. The continuing trade disputes among major economies and the raise in protectionism present significant challenges. And given the complexity of the global supply chains, additional trade barriers will result in higher costs for doing business, which will be borne not only by exporters, but also by importers, as well as end consumers. Trade friction creates uncertainty. That weighs heavily on global investment and business sentiment. It also adds downside risk to economic growth and increased volatility in financial markets. But I can assure you, protectionism won't happen here in Hong Kong, the freest economy in the world. We support free trade and the multilateral trading system, as well as the free flow of capital, people and information. Indeed, it is the cornerstone of our economy. While our small, open economy can hardly expect to remain untouched by global forces, our financial system has withstood countless challenges over the years and the decades. The International Monetary Fund last month commended Hong Kong's prudent macroeconomic policies. The Fund noted that our long-standing buffers will help Hong Kong maintain stability despite the increasing risks confronting global growth. And we are now enhancing our regulatory regime and the resilience of our markets. We are equally committed to implementing international standards that improve our banking sector's buoyancy. Hong Kong is a staunch supporter of the regulatory reforms of Basel III. And we are working to implement the Basel Committee's latest capital and financial-exposure standards. Over the past year or so, we have approved legislation to boost our anti-money laundering and counter-terrorist financing regime. We are also preparing to establish a risk-based capital regime for the insurance industry. The goal is to align Hong Kong's regulatory regime with international standards and to make capital requirements more sensitive to the level of risk that insurance companies bear. A new statutory corporate rescue proposal, together with insolvent trading provisions, will also be introduced. It will help those experiencing short-term financial difficulty revive their business by maximising the potential of a viable company and, in doing so, preserve jobs. If this is not possible, we hope to achieve a better return for a company's creditors than is the case in an immediate insolvent winding-up. Other than regulatory enhancements, we are also stepping up efforts in market development. Hong Kong is the world's leading IPO (initial public offering) centre, last year raising some US$37 billion. In the past 10 years, we topped the world in IPOs on six occasions. And we're determined to keep that global financial crown. Last April, our Stock Exchange implemented a new listing regime. It allows new economy companies with a weighted voting rights structure, as well as pre-revenue and pre-profit biotech companies, to list in Hong Kong. I am pleased to note that so far seven such companies have been listed under the new regime and there are many more in the pipeline. Hong Kong is also a premier asset and wealth management centre, thanks to increasing wealth creation in the Mainland of China and other parts of Asia. At the end of 2017, our asset and wealth management business stood at US$3.1 trillion, with two-thirds of those assets coming from non-Hong Kong investors. We have also introduced a new open-ended fund structure, providing an alternative choice to the unit trust structure in the setting up of funds. It's the first time Hong Kong has put in place a dedicated legal regime for a fund vehicle. And we are now looking into the introduction of a limited partnership regime for private equity funds in Hong Kong. To attract additional funds to Hong Kong, we have been rolling out attractive tax measures. We have tabled a bill at the Legislative Council to provide profits tax exemption for onshore funds operating in Hong Kong, in addition to offshore funds. Our intention is to allow all funds to enjoy tax exemption regardless of their structure, their size or the purpose they serve. We are, to be sure, looking to maximise our role in the Guangdong-Hong Kong-Macao Greater Bay Area. For those who are not familiar with this development plan, the Greater Bay Area is a region covering 11 cities with a combined population of close to 70 million people and a collective GDP of US$1.5 trillion. The Greater Bay Area offers huge potential for the Hong Kong financial services industry. So does the Belt and Road Initiative. We expect to contribute in a number of areas under this far-reaching Initiative: serving as the financing risk management and professional services hub for infrastructure projects, Asia's major asset management centre, as well as the global hub for offshore Renminbi business. Financial technology is also high on our policy agenda. It will help us diversify our financial services development, while sustaining its growth. Indeed, fintech is fast transforming the sector, while creating new business opportunities. We expect to grant the first batch of virtual bank licences shortly, offering the public more choice and efficiency in their banking services. The Open Application Programming Interface framework for the banking sector is also being implemented in phases. It will enable collaboration between banks and technology companies. And that can only create more innovative and integrated financial services. Green finance is also a policy priority. We see Hong Kong serving as a premier financing centre for international and Mainland green companies and projects, raising funds by issuing bonds and IPOs. The Hong Kong Quality Assurance Agency launched its Green Finance Certification Scheme last year, providing third-party conformity assessments for issuers on their green debt instruments. 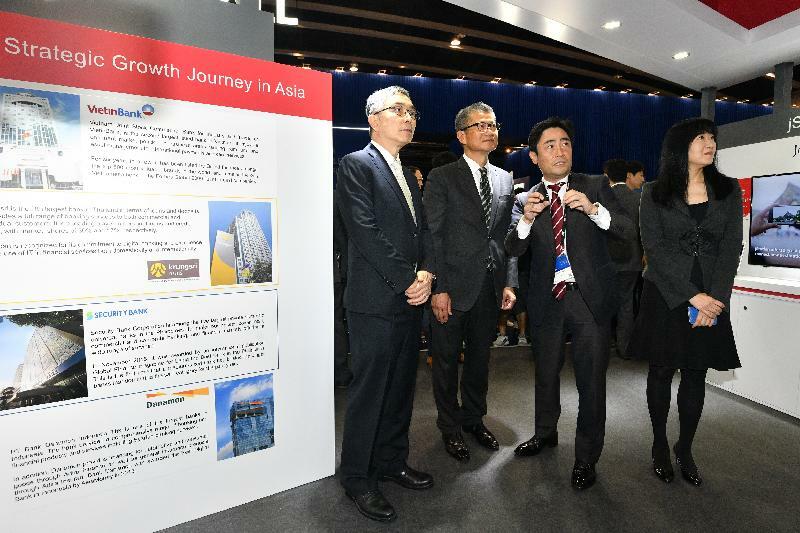 Numerous local, Mainland and international organisations, including the Asian Development Bank, the World Bank and the European Investment Bank, have made use of Hong Kong to issue green bonds. We will soon launch a Government Green Bond Programme with a borrowing ceiling of about US$13 billion. That should encourage more issuers to arrange financing for their green projects through our capital markets. There's much more, either in the works or the planning stage. The point, ladies and gentlemen, is that Hong Kong is prepared for whatever this new year - and well beyond - ultimately brings us. Like you, of course, I'm hoping that the flag of free enterprise is soon proudly raised, and flying, in economies all over the world. Hoping that, in the Chinese New Year of the Pig, just around the corner, we can all continue to bring home the bacon. I wish you all a rewarding Forum and the best of business in 2019.